Neil Summers has been an avid bowhunter for the past 28 years, bowhunting extensively on six continents and bowhunted in 27 different countries. During that time he has taken most of the big game species in North America and Africa; in addition many in Europe, Asia, South America and the South Pacific. In 1986, he founded Bowhunting Safari Consultants, a booking agency that organizes bowhunting excursions worldwide. This company puts clients together with the appropriate guide/outfitter and arranges the details for their hunting adventures. Neil’s personal commitment to “fair chase” bowhunting has driven the long-term goals for his company. Since 1986, Neil has been in Africa 33 times, spending 4-6 weeks per visit, investigating the best bowhunting available on the continent. Currently, Neil acts as an advisor to the Bowhunting Development Committee of Safari Club International and is on the Advisory Board of the National Bowhunter Education Foundation. Neil is also a Senior Member of the Pope & Young Club and a member of Christian Bowhunters of America. 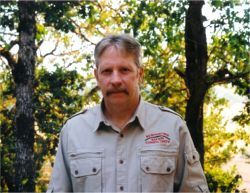 Neil has also been free-lance outdoor writer for many years and developed training course materials used by the International Bowhunter Education Program as part of their Hunter Responsibility Series.